Easy on the eyes. Easy on the budget. This Luxe DVD and flash folio will make a great impression to every customer who is lucky enough to receive it! Easy on the eyes. Easy on the budget. These luxe DVD and flash drive folio books are an ideal way to deliver digital images to clients who might like to have them (or requests them!) in multiple formats. 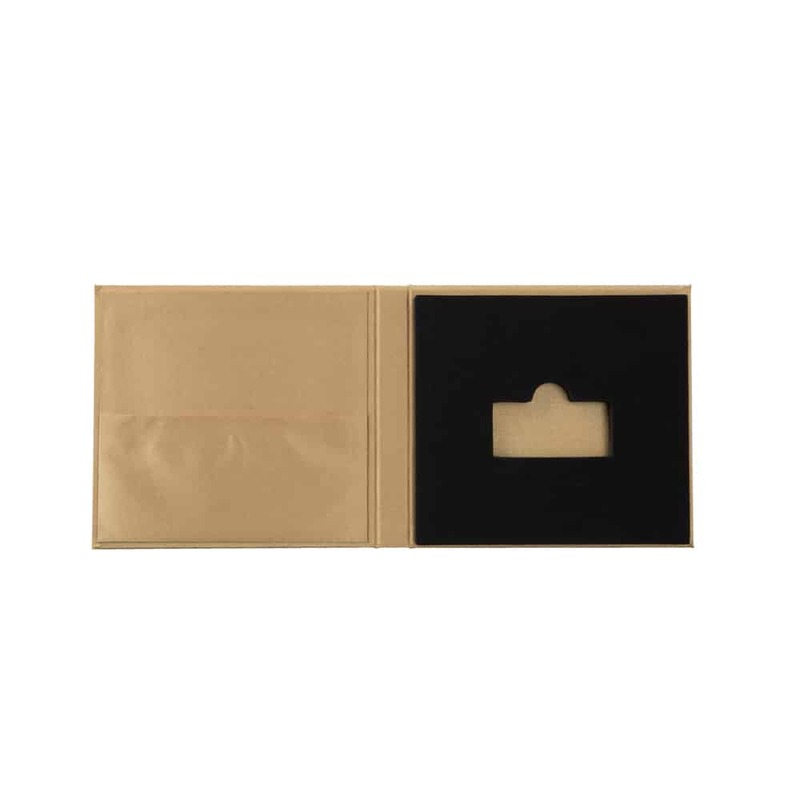 The inside cover of this folio features a subtle sleeve in which a CD or DVD can be inserted. On the opposite side, a flash drive fits into a dedicated compartment cut out of the bed of foam that serves to protect it while also providing the piece it’s .75” depth. To ease with the removal of the drive, a cut out in the drive compartment allows the recipient to easily get a finger underneath the drive. The outer cover of this book-like folio is fully customizable with laser engraving of your logo or sentiment directly onto the black, grey, gold or taupe-colored finish. Delivering images from an event you photograph annually? Add the event name and year to the cover so your client can arrange these books neatly on a shelf for easy access … and as a reminder of your business every time they reach for them. Now that’s smart!